Guinness Draught Stout poured from a widget can. The foam on Guinness is noticeably darker than that of Murphy’s. If you’d like, you can blend small amounts of other dark grains (including chocolate or black patent) in with the roasted barley. Swapping some of the roasted barley for chocolate malt makes for a smoother stout. Some commercial stouts use either chocolate or black patent malt as their only dark grain. But, for dry stouts that taste more like the examples we are discussing here (Guinness, Murphy’s, Beamish), keep roasted barley as the most abundant dark grain. Small amounts of crystal malt can be added, but not so much that they compete with the dark roasty character or add substantial body. Murphy’s Irish Stout contains just enough crystal malt that you can pick it out. The pale part of the grain bill can be pale ale malt cut with about 10% flaked barley or you can use all malt. Flaked barley is unmalted barley that has been steamed and pressed into flakes by rollers; it is higher than malted barley in beta-glucans and this can aid in head retention. Some people will say that your base malt doesn’t matter in a beer this dark, the roasty flavors will cover it up. I don’t believe this and recommend using a good quality pale ale malt. As with other dry styles of beer, you can dry the beer out by swapping table sugar (sucrose), which is 100% fermentable, for a small portion of the malt. However, a dry stout does not need to be bone dry or lacking in any body, so don’t go overboard in this respect. The low original gravity ensures you will reach a low finishing gravity, even with only moderate attenuation. More than 10% sugar in the grain bill would be excessive. 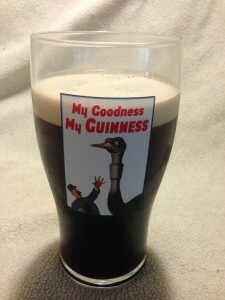 As an example of a dry stout, I give my favorite homebrew dry stout recipe, which was inspired by Murphy’s. This stout is formulated to be served with CO2, not the nitrogen mix that Guinness popularized. Darkly roasted grains are smaller than pale malts, and you may need to mill your dark grains separately, tightening the mill gap slightly for the dark grains. Take note of how finely you crushed your dark grains — if your beer turns out excellent, you will want to be able to replicate that crush. A single infusion mash is your best option for a dry stout. You want a dry beer, so mash at 148–152 °F (64–67) for around 45–60 minutes. A regular mash thickness of around 1.2–1.4 qts./lb. (2.5–2.9 L/kg) will work fine. Since your overall grain bill is small, you may need to stop sparging before you collect your full pre-boil volume of wort. As you sparge the grain bed, the gravity of the runnings decrease and the pH increases. There is a point at which the pH can get high enough to extract excess tannins. So, it’s best to stop collecting wort when the runnings drop below 2 °Plato (1.008) or the pH exceeds 5.8. A dry stout will likely have a hint of astringency from the high level of dark grains, and this is not a bad thing. However, oversparging can exacerbate this and should be avoided. This series of posts on dry stouts concludes on June 21st.